ViewSonic Corp., a leading global provider of visual solution products, has completed its first full calendar quarter with a realigned Canadian organization under the leadership of Deidre Deacon, General Manager. Following Deacon's appointment last fall to the expanded new role, the organizational structure of the Canadian team was realigned to support the implementation of a new growth strategy that expands the company's focus in Canada to new niche markets, deepens its channel partnerships, and includes plans to launch new solution and category products in the coming year. With Deacon at the helm, ViewSonic Canada is currently outpacing industry growth by doubling the large format display (LFD) business in both units and revenue year over year. Last quarter, ViewSonic Canada realized a 15% year-over-year increase in units shipped across all categories and double digit growth over the previous (Q4 2016) quarter. "Last quarter's results for Canada surpassed the company's expectations and projected market growth in large format and interactive display products," said Jeff Volpe, President for ViewSonic Americas. "Our brand promise has always been about great performance, fantastic value, and world class support. Under Deidre's leadership, and with the support of our talented team and channel partners, we are delivering on this promise. With this year's planned introduction of innovative new products and solutions that deliver a new level of display performance, our Canadian team is optimally positioned to support market demands and will continue to work with our partners to drive significant growth for all parties over the next five years." As General Manager of ViewSonic Canada, Deacon is the senior executive for the region and oversees all aspects of the business - from charting the future growth of sales, to maintaining and developing the dealer distribution network, to leading overall strategic business planning. She was appointed to this role following a successful 18-year tenure with ViewSonic that included progressive sales and management positions in both Canada and the U.S. Under Deacon's leadership, the realigned Canadian team has delivered its best ever result in the large format display (LFD) category, outpacing overall industry growth. The demand for ViewSonic's large format and interactive displays has been driven by new trends in resolution, colour performance, and productivity. At the forefront of this product line is the ViewSonic ViewBoard®, a line of interactive flat panel display solutions designed to increase engagement and collaboration by allowing users to write, highlight, edit, and transform documents and images on the screen in real time. The products are optimized for collaborative multi-user productivity for both the classroom and the corporate board room. According to PMA Research, the industry analyst firm that specializes in market data for the Display industry, the market for Interactive Flat Panel Displays (FPDs) grew at a rate of 60% in 2016 with expectations for unit growth of up to 50% in 2017. PMA reports that market growth in large format displays was 23% in 2016, with double-digit growth rates forecasted for 2017. PMA Research follows the Projector and Professional Large Flat Panel display markets exclusively, and has long been considered the authoritative source for market information about the display industry. 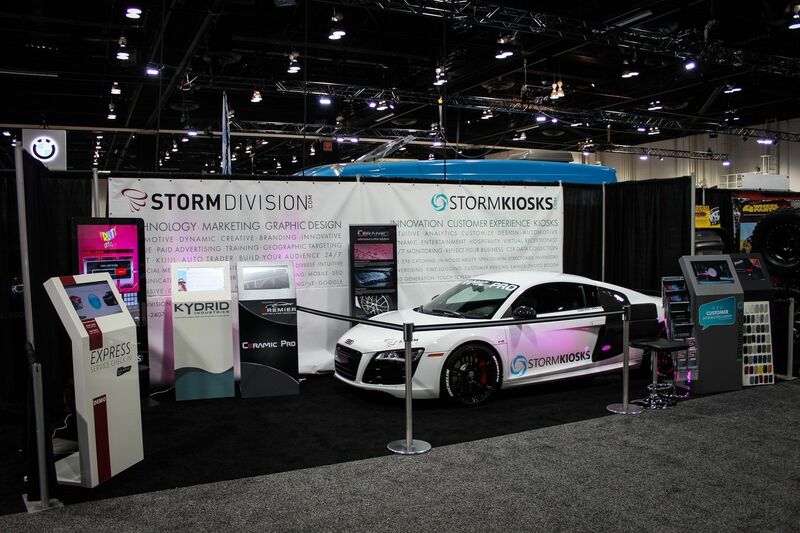 Calgary, Alberta-based Storm Division - a ViewSonic reseller focused on rapidly evolving website design, marketing, and software solutions - is one example of a channel partner that is successfully integrating a range of ViewSonic's large format and interactive display products into solutions to meet the growing demand of its customers across a range of industries. According to Nathan MacKenzie, Chief Marketing Officer at Storm Division, "The applications are now so diverse and the screen technology so much more robust and integrated. Demand is rapidly growing for large format display solutions, from small businesses and automotive operations to casinos and commercial properties. Everyone wants that wow factor. As interest broadens, we have a growing number of really creative and unique projects in the pipeline, and it's just the beginning. The applications are endless." This news release contains forward-looking statements that reflect the Company's expectations with regard to future events. Actual events could differ significantly from those anticipated in this document. Trademark footnote: ViewSonic and the ViewSonic trademarks are trademarks or registered trademarks of ViewSonic Corporation in the United States and/or other countries. All other corporate names and trademarks stated herein are the property of their respective companies. About this company ViewSonic Corp.